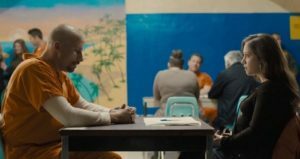 Have you seen the previews for Laure de Clermont-Tonnerre’s “The Mustang?” This is the story of an outcast prisoner (Is there any other kind in the movies?) and the wild horse he tames. Or who tames him. Predictable? Yes. But also brilliant, thanks to a subdued yet powerhouse performance by Belgian actor Matthias Schoenaerts, and a non-overly-sentimental original screenplay by de Clermont-Tonnerre, Mona Fastvold, and Brock Norman Brock.